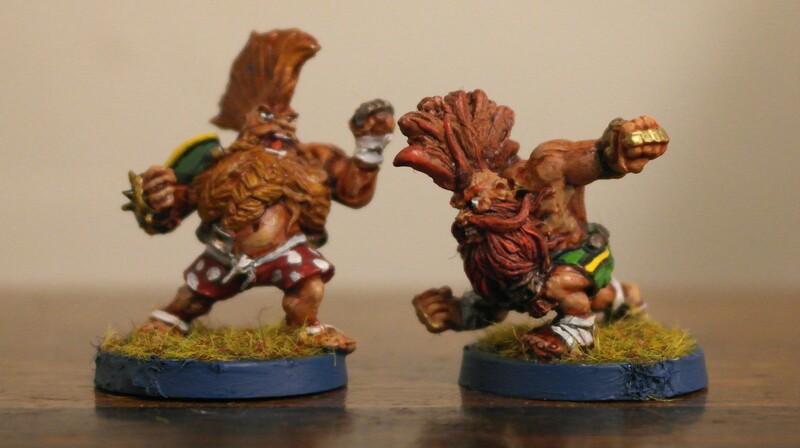 “Even though they are fairly new on the Blood Bowl scene, the team seems to have a quite realistic view on how they’ll do. A rennaisance themed Ogre Team? Yes indeed. 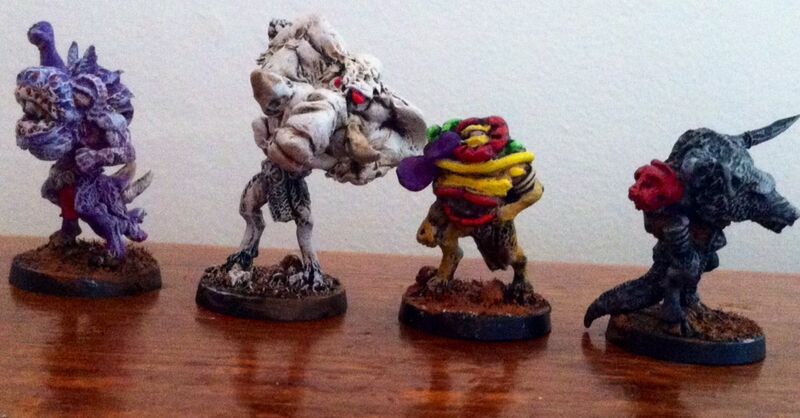 A great joy to paint them, they are made by Kevin “Goblinmaster” Adams, the snots also. He worked for GW in the eighties and made the Snotling Pump Wagon for instance. Here´s more info on Kev. 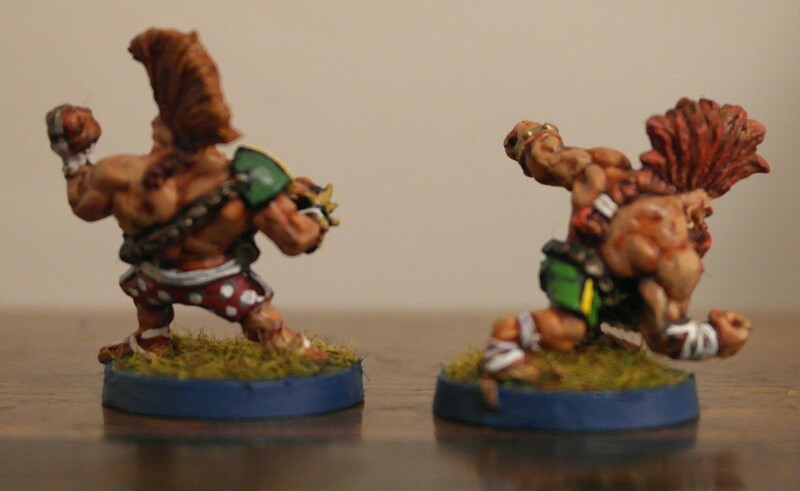 The snots were procured from GW and the Ogres from Wargames Foundry, they´ve made a special site dedicated for these chaps called Warmonger. I really really want to buy these orcling scouts but sadly I havent found any practical use for them. Yet. 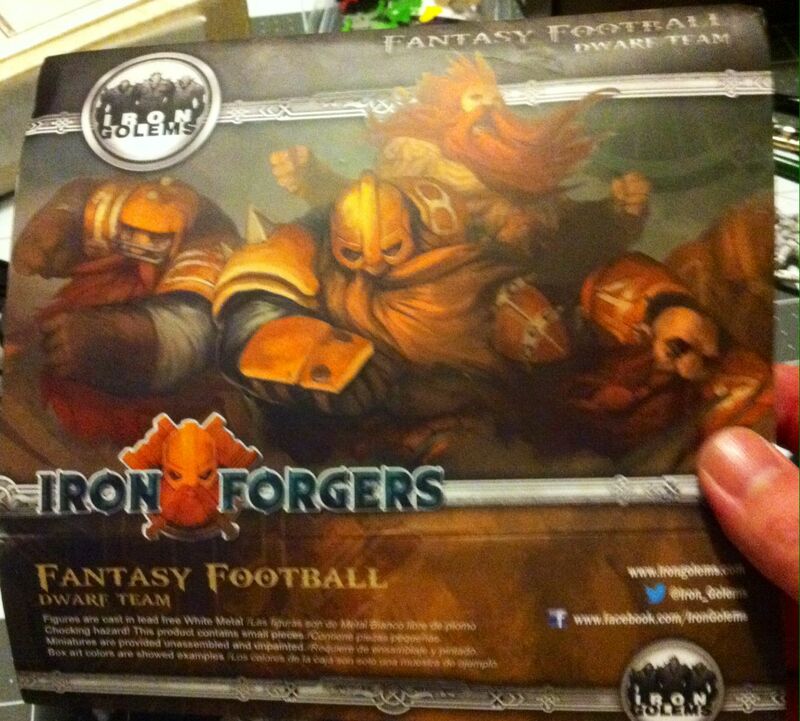 It is not specifically designed for BloodBowl, I just saw them and realised that I needed them. 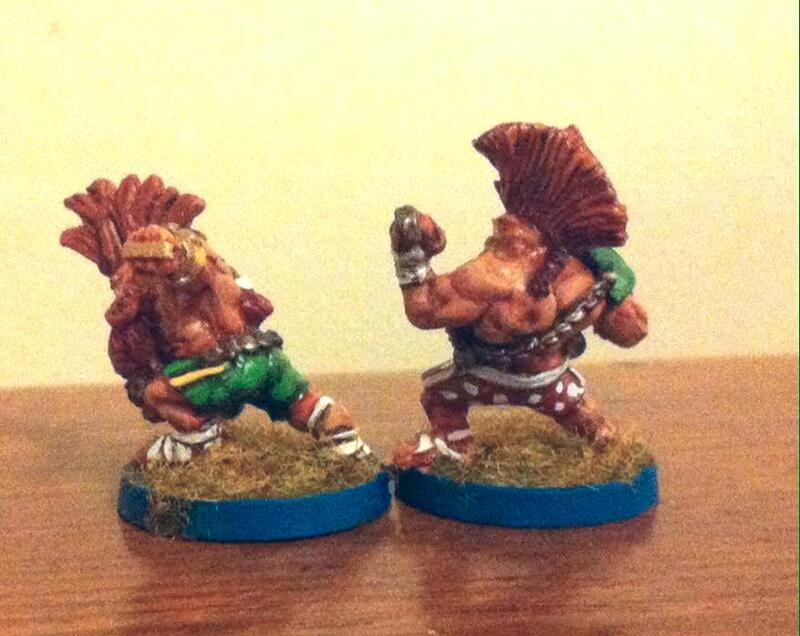 And since I´m basically only playing BloodBowl at the moment, that´s what they needed to be. The snots were found in a box in the basement. 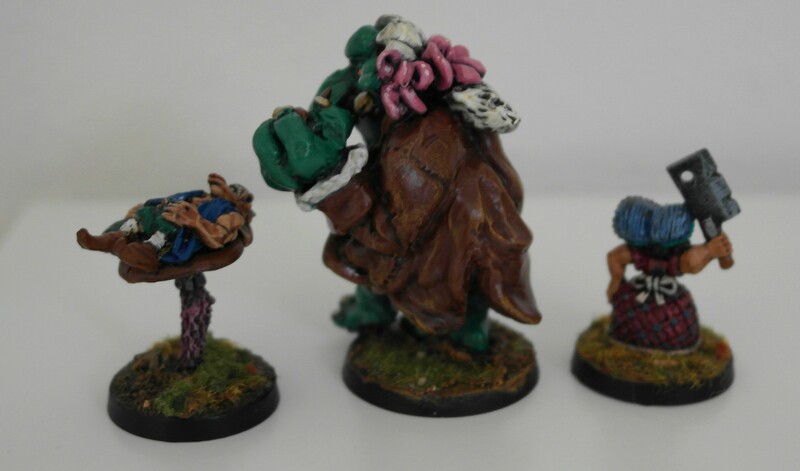 I have a great pile of Orcs & Goblins stuff from my WHFB days, these chaps used to be the crew of the Snotling Pump Wagon (an older version). The team has been participating in the open season and the so called Silly Season in our local League. 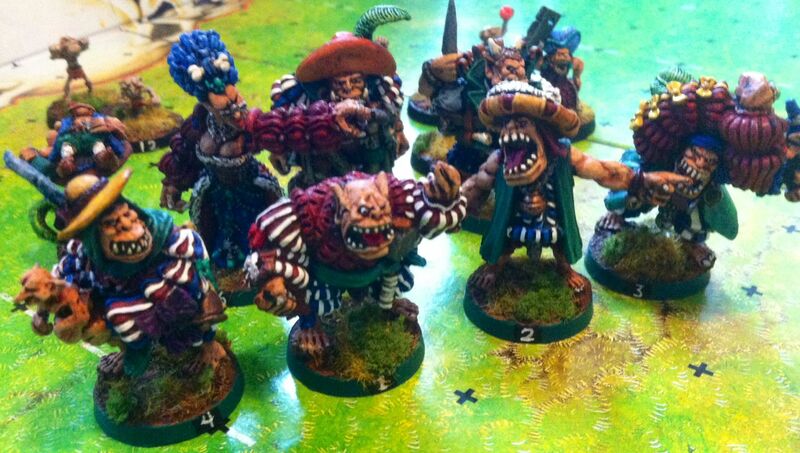 Theyve had a rough start to say the least, in nine games theyve lost no less than three ogres, thats equal to 420 gc. I´ve still won 4 games though, so somehow they´re pulling it off. The plan is to expand them to also double as an orc team, then the first four ogres will be black orcs. They´ve also been to two tournaments, Närkebowl in Örebro and GothBowl in Gothenburg. 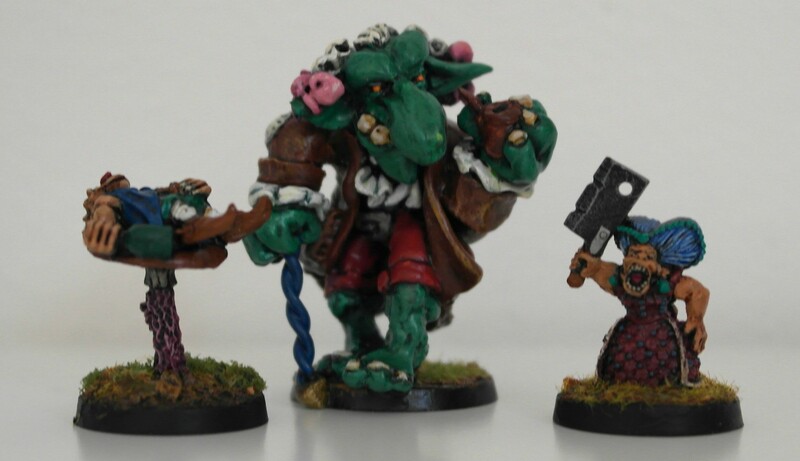 The passed out gobbo on the shroom is a reroll marker, the goblin in the evening gown with the meat cleaver is the apothecary. Hope you like them, I surely do. If you want to follow them and see how they perform on the pitch, you can visit them here. Yeah, here are enough pieces for a starting roster. More to follow, starting off the year really good. 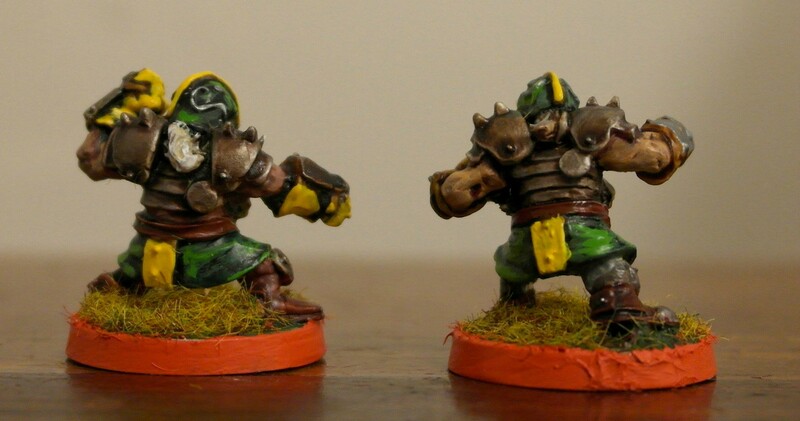 Yeah, first up are two positionals for my dwarven team in BloodBowl. 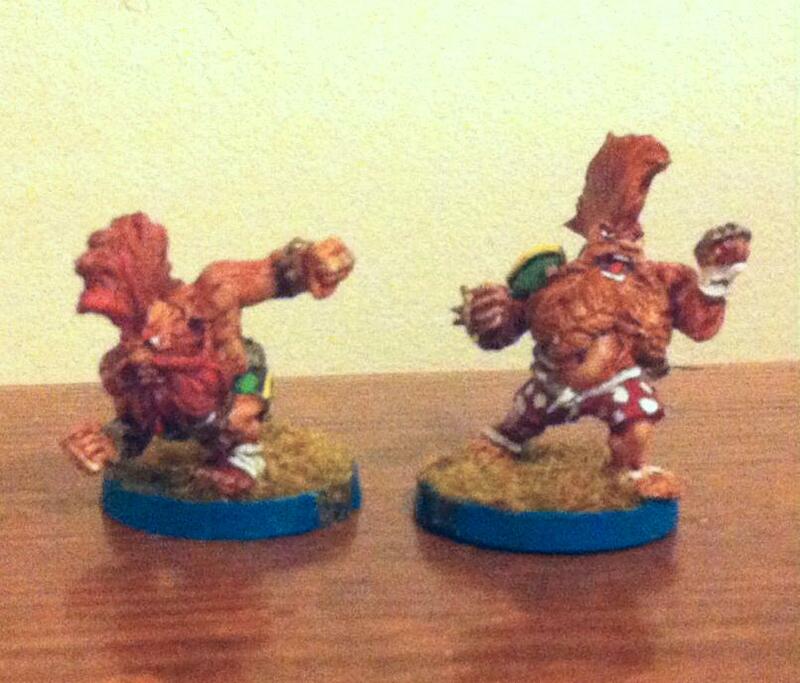 The Trollslayers, “Fierce” Bossman and Dan E Gloveless, will be part of Dorf Chesthair City “The Pears”. Dan is so eager to get on the pitch so he isnt even properly dressed. The models are from Iron Golems kickstarter that finished last year and they are sculpted by the incredibly gifted Pedro Ramos. “Fierce” is supposedly the Grimm Ironjaw mini but I´m quite fond of him so I made him a permanent part of the team. Some more reserves, bazooka and chainsaw in the piles. Earlier WIP photos of the team. As you can see more are on the way. And here´s the front of the box. The painted/bought ratio is so far so good but we´ll see what happens, GW has just announced that they are gonna bring back Necromunda and BloodBowl in some form and if they are releasing anything like that I´m most likely to pick them up. The early mock-ups and sketches they showed on their 40th anniversary (the Forge World Open Day)last week was very promising I must say. Check them out here! Bloodbowl was the game that brought me back to the miniature painting and sometimes even playing hobby after a couple of years hiatus. 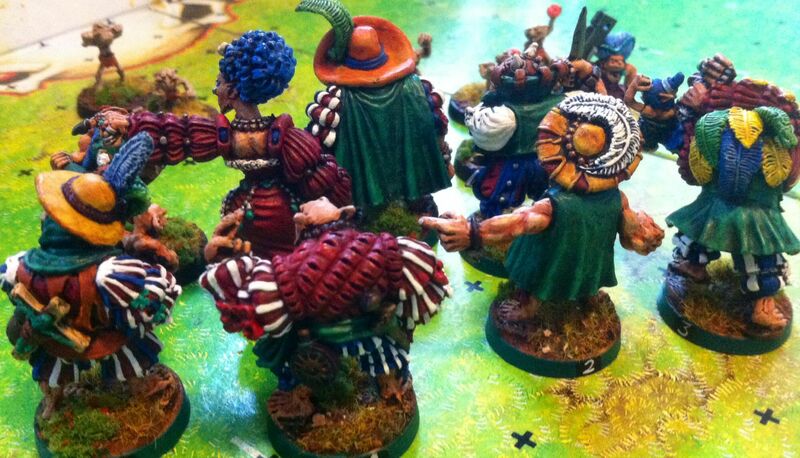 In short it’s a boardgame of football, but with elves, dwarves, orcs and wizards. A bit like chess, a lot not like it. A fantastic game. 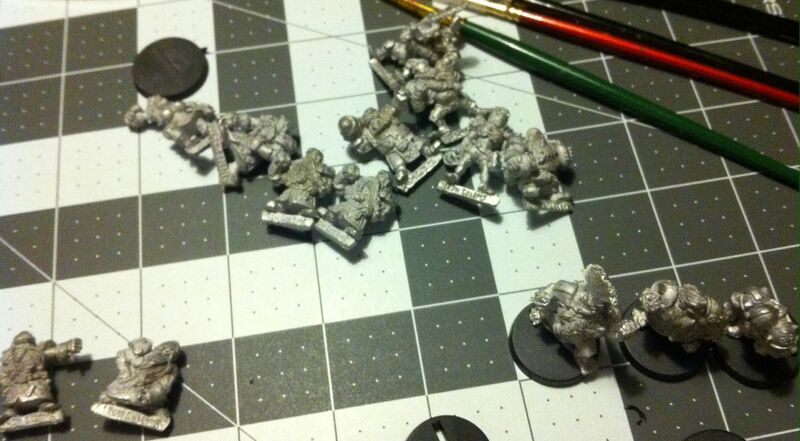 Your team consists of usually 11-16 players so it’s not necessary to buy and paint hundreds of miniatures. Unless you want all types of teams that is. 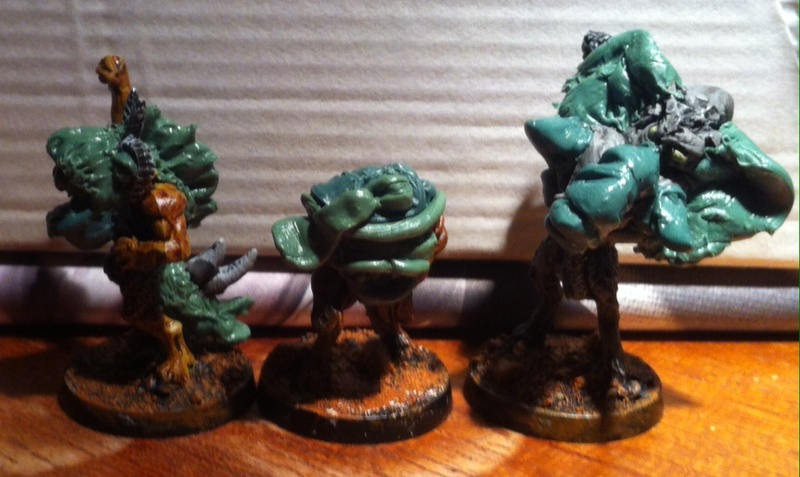 These three players will be beastmen in my new Chaos team. 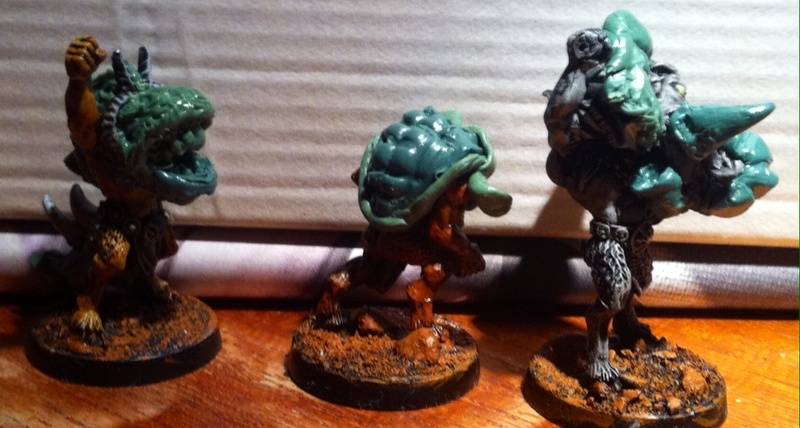 In order to make them more diversed from the generic goatman look I’ve applied greenstuff. Inspiration comes from a tzeentch warband in a White Dwarf magazine (#128 I believe), the Wheel of Time series, early GW catalogue and the Oldhammer community. Pics are not that great, will do better when project is finished. Promise.